Why are those who work for the state never held accountable for the damage they inflict? Few Americans recognize the Yukon-sized legal rights void in their daily lives. I was recently reminded of this hard fact after encountering what appeared to be an anti-tank spike left over from the battle of Stalingrad in a government parking lot. Unfortunately, government’s promise to serve also routinely conveys a license to harm. Heading for a hike along the Potomac River, I pulled my car into a spot in an unpaved, uneven Fairfax County Park Authority lot at Difficult Run Stream. I nudged forward and stopped before my wheels tapped the concrete block at the end of the spot. The front of my car extends 20 inches beyond my wheel and I was chagrined to hear something tearing into the underside of my Ford Contour. I stepped out of the car and saw that the concrete parking barrier was topped by an unmarked five-inch steel rebar that had ripped through my plastic bumper, tore loose my power steering hose, and doused the block with liquids from my engine. Most of the nearby concrete bars had no such spurs but Fairfax County apparently missed this one. Ever the optimist, I filed a claim with Fairfax County for the $129 power steering hose repair (the towing was “free” thanks to GEICO and that bumper was already ugly before the gash). Seven weeks later, Fairfax County notified me that “you failed to pay full time and attention to a stationary object resulting in the proximate cause of this loss and contributing to you [sic] own damages.” Apparently, since a Fairfax County employee did not willfully target my power steering hose, the government had no liability. The letter cited a 1947 Virginia court case that purportedly exonerated Fairfax County. I read the decision seeking profound insights into malignant parking lots. Instead, it dealt with a drunk who was heaved out of a Norfolk movie theater. While sprawled on the sidewalk, he cast a “vile insult” towards a passing theater employee who punched him out. The court rejected the man’s lawsuit for damages thanks to his “contributory negligence. If the government decides to provide a service, it is rarely liable for any damages it inflicts. Virginians will be hugely inconvenienced next year when Washington, D.C.’s public transportation system, Metro, shuts down subway lines beyond Reagan National Airport for 98 days straight. But because Metro is shielded by sovereign immunity, victims are entitled to nothing except endless replays of Metro’s “we regret the inconvenience” announcement. Public schools are perhaps the largest “no fault” government service. A federal judge recently rejected a lawsuit claiming that utterly dysfunctional schools in Detroit had violated children’s “right to literacy.” No matter how much parents are forced to pay in taxes for schools, “no plaintiff to date has been able to convince a court that a school owes him or her any more than ‘a chair in a classroom,’” as law professor Judith Berliner Cohen wrote. Joining the PTA is a paltry substitute for a legally enforceable claim to decent schooling. The same principle of unaccountable government poses deadly perils. Police shot and killed almost a thousand people last year, and Supreme Court rulings provide broad immunity for police who open fire. High speed police chases have killed more than 5,000 innocent bystanders and passengers and injured more than a quarter million people since 1979. Yet the victims and next of kin are routinely out of luck when seeking damages. 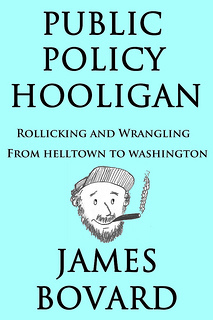 James Bovard is the author of Lost Rights, Attention Deficit Democracy, and Public Policy Hooligan. He is also a USA Today contributor. Follow him on Twitter @JimBovard.